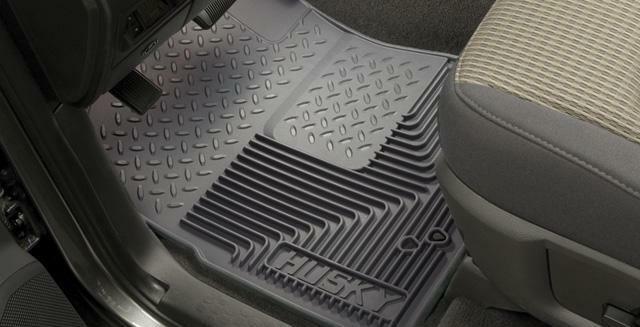 Husky Liners Heavy Duty Floor Mats provide year round carpet protection and are available for virtually all of today’s top selling vehicles. The Heavy Duty Floor Mats are vehicle specific and have features you will not find on ordinary run-of-the-mill universal (flat) floor mats. An extra thick driver’s heel pad provides years of life while the high perimeter ridges contain spills and debris. raised ridges keep your feet out of water, mud, and dirt. Our material is guaranteed not to crack or break even in the most extreme conditions. Heavy Duty Mats are easily cleaned and feature our Sta-Put Nibs on the reverse side to help keep the mat in place. They are available in black, grey and tan for front, second/third seat and center hump areas. Designed and Manufactured in the USA and come with a Lifetime Guarantee against cracking.